Peppermint Shortbread Cookies, a quick and easy toaster oven cookies recipe. 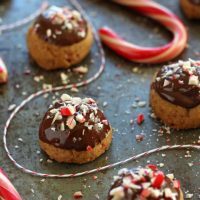 Just one bowl, eight ingredients including a melted chocolate glaze and crushed candy cane topping! Last week we dominated the office potluck with a super moist White Chocolate Cranberry Orange Snack Cake. This week let’s use our holiday baking powers to spread cheer and build a little neighborly goodwill. Because nothing says “we’re friends so please call me at work if you see I left my garage door open” like a small batch of toaster oven baked Peppermint Shortbread Cookies. These simple toaster oven shortbread cookies (butter, sugar, flour) have a subtle hint of minty coolness courtesy of peppermint oil. Peppermint oil is essentially the oil from the peppermint plant usually mixed with sunflower oil. It has a much stronger, cleaner and sharper mint flavor than peppermint extract. Because it’s so potent, use care when measuring. To keep your peppermint oil fresh it’s best to store it in the refrigerator. If you’re not a big mint fan you can easily substitute pure vanilla extract or just skip an added flavoring all together. Whatever you do though don’t ditch the crushed peppermint candy cane. The tiny flecks peppered throughout the cookies bring added color, crunch and a touch of sweetness. 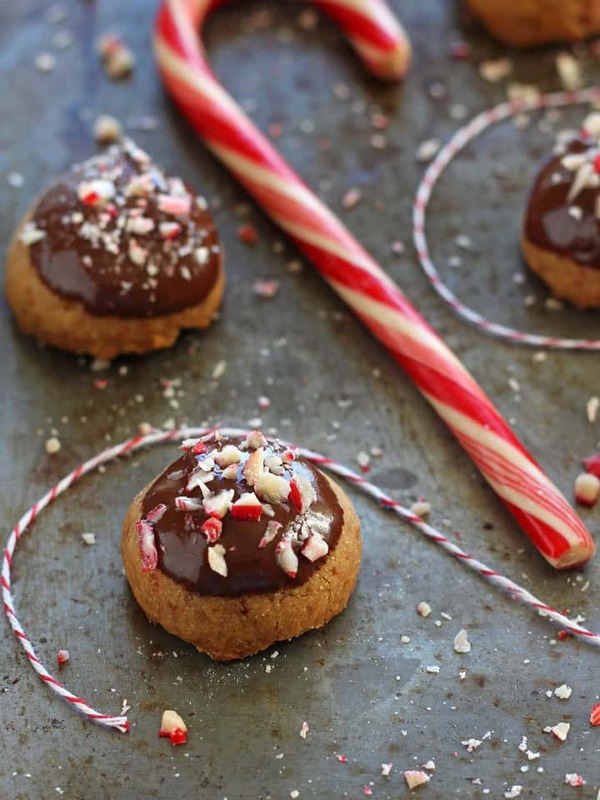 The whole recipe needs about one regular sized peppermint candy cane. To easily crush a candy cane without making a powdery sugar mess place the candy cane in a zip top bag, seal well and smash the candy cane with the base of a metal measuring cup or a rolling pin. I like to aim for peppermint chunks that are somewhere between a mini-chocolate chip and a sprinkle. They don’t all need to be the same size, it really depends on how much texture you want to add to your cookie. When baking, don’t let browning be your test for readiness with these cookies. Although they will have lightly browned caramelized bottoms, the cookies are actually done once they feel firm to the touch. If you wait for all-over browning, they will be overcooked. 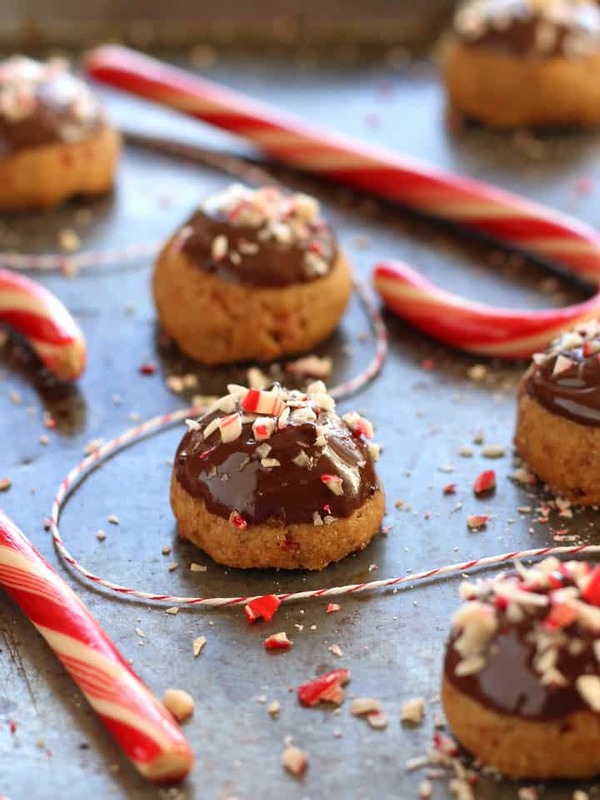 Now that you’ve got your buttery shortbread cookies nice and cooled add a few finishing touches with melted semi-sweet chocolate and the remaining crushed peppermint candy cane. Give the chocolate about 20 minutes to firm up (it will turn from shiny to matte). Once the chocolate sets, steal a cookie for yourself 🙂 and pack the rest of these tasty peppermint shortbread cookies into a mason jar or cookie box. Slap on a nice bow or ribbon and go brighten your neighbors day! 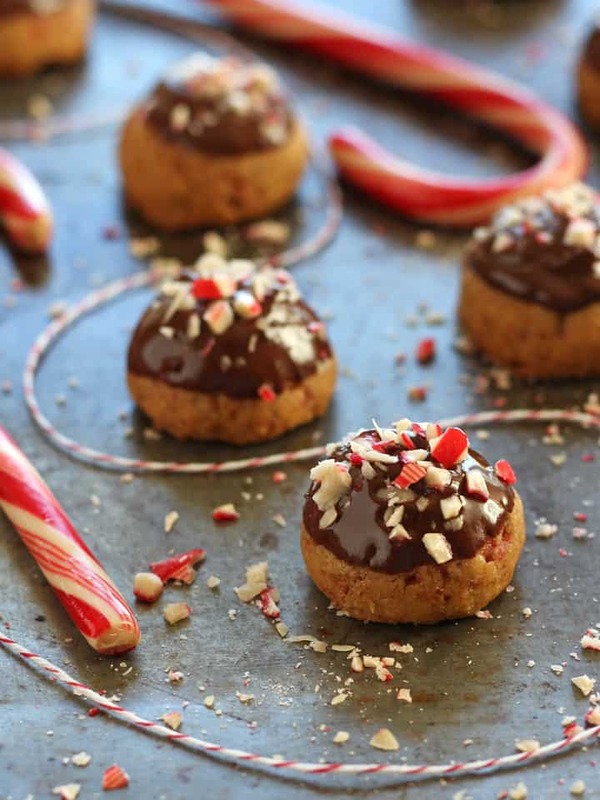 A small batch of crispy crumbly butter-rich shortbread cookies studded with crushed peppermint candy cane and topped with melted chocolate. Preheat toaster oven or oven to 350F. In a small bowl use a wooden spoon to cream together the butter, coconut sugar and peppermint oil or vanilla extract until light and fluffy. You can accomplish this quicker with a hand-mixer if you like. Stir in the flour, sea salt and 1 tablespoon of the crushed peppermint. Mix until a dough forms. 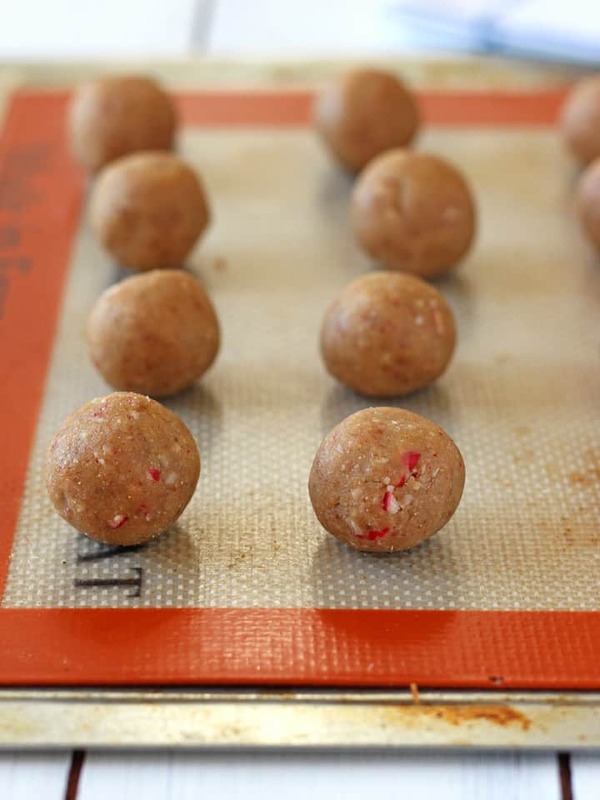 Shape dough into twelve 1-inch sized balls and place on a greased or silicone baking mat lined cookie sheet. Bake cookies at 350F for 12 to 15 minutes. The cookies will be ready when their tops are firm to the touch. Allow cookies to cool on the sheet for 3-4 minutes and then transfer to a baking rack to cool completely, around 30 minutes. Once cookies have cooled, melt the chocolate chips and coconut oil in the microwave* until smooth. 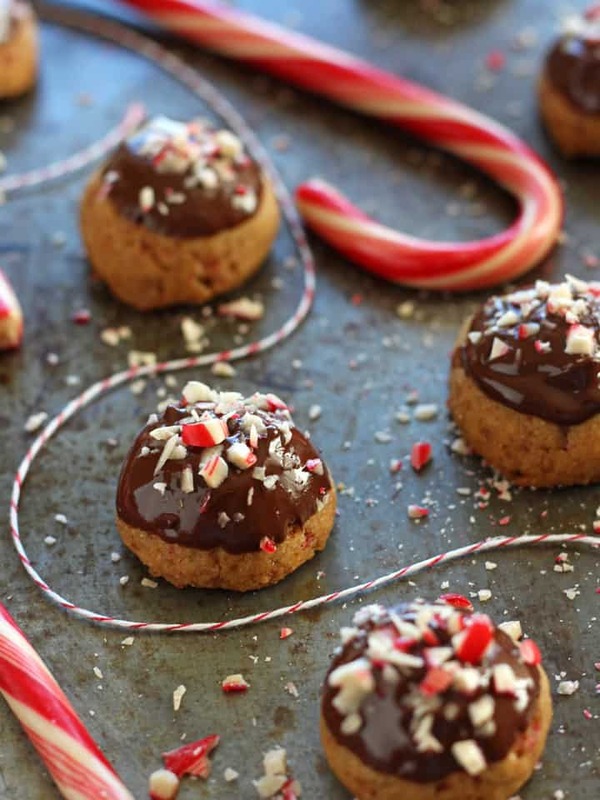 Dip the top of each cookie into the chocolate or drizzle chocolate onto cookies and sprinkle with remaining tablespoon of crushed peppermint candy cane. Allow chocolate to set, about 20 minutes. *For glaze: Microwave the chocolate chips and coconut oil for 8 seconds, stir mixture and repeat the 8 seconds heating and stirring until chocolate is melted, smooth and shiny. Watch the chocolate carefully as it can scorch easily in such a small quantity. Before baking you want the dough to be cold. If you're finding it difficult to roll round ball shapes with the dough because it is soft put it in the fridge for 5 or 10 minutes to firm up before baking. Prep time includes 45 minutes inactive time for cookies cooling and allowing chocolate glaze to set. This post was shared on Buns In My Oven What’s Cookin’ Wednesday. My husband would love these! Thanks for sharing, Brie!